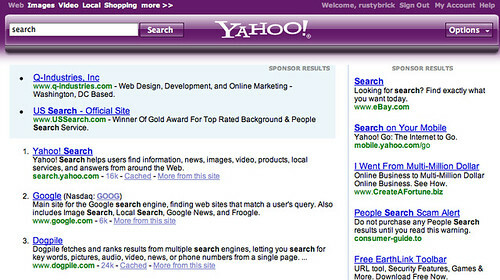 Earlier this week, we reported that Yahoo was experimenting with a blue header for their search interface. I just did a search at Yahoo and I see a purple header being tested. Clicking on the "options" button on the right, opens a menu with "advanced search," "preferences," "advertising program," and "about this page." Those links also appear on the normal Yahoo! Search interface. The Yahoo! Search home page remains to be the same white background and same user interface for me.